Holds any Kayak up to 34" wide and/or 75 lbs. 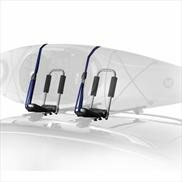 Features a lockable, folding mechanism for increased overhead clearance when not in use. J-cradles advanced design makes one-person loading easy. Fully adjustable, premium padding cradles & protects watercraft. Ultra strong, rust-resistant powder-coated steel tubing. Easily transfers from one vehicle to another if necessary.